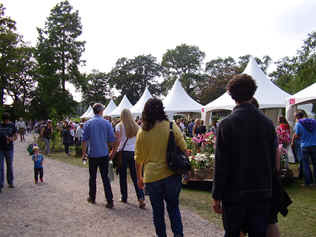 We arrived at about 11.15am and after having a cup of coffee and some of our packed lunch we did a tour of the Flower Show, there were over 70 stalls full of plants and gardening related things. Some of the plants were beautiful and unusual and a lot were new to the market. I would have loved some of them but unfortunately my purse would not stretch that far and I would have been upset if I had got them home and they had died after paying so much for them. There was one Cactus Stall belonging to Richard and Sheena Drane, who had quite a lot for sale. We didn’t buy any though. Dahlias - ‘cactus’ no doubt! 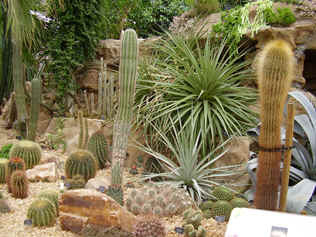 Cacti and succulents in the temperate section of the Wisley Conservatory. 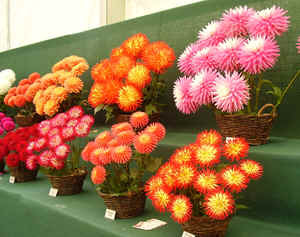 After the Flower Show we went to the National Dahlia Society Show. I had never seen so many brilliant colours all in the same place before. It was an absolutely spectacular sight and although it was the last day of the show the flowers still looked nice and fresh. Beautiful. By this time the weather was very warm after a chilly morning first thing and we made the long walk to the glasshouses where the cactus and succulents and tropical plants are kept and displayed. Cacti, succulents, banana trees, water lilies and orchids plus many other trees, shrubs and plants are all in there. Leaving the glasshouses we made our way back to the main area, stopping along the way to finish off our lunch, Reaching the Plant Centre this was a place where I could have spent a long time but time was short before we had to get back on the coach for the homeward journey. However, I did manage to purchase quite a few plants at prices I could afford. All that is left to do now is plant them in the garden and hope they survive. Back on the coach, hot and tired, we reflected on the day and felt that it had been well worth the effort and we had thoroughly enjoyed it.